Venus is getting some rare attention, thanks to NASA’s Parker Solar Probe. It will swing by the planet on its way to study the sun’s atmosphere. 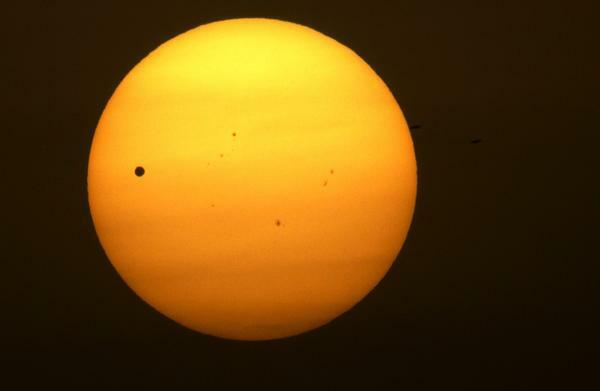 Here & Now‘s Peter O’Dowd talks with astronomer Dean Regas (@DeanRegas) about the NASA mission and what’s known and unknown about Venus. “It’s one of those things you think, ‘Alright, we’re going to fly a mission to the sun.’ Now, that sounds easy in one way and hard another way. You think, ‘Alright, well, we can aim stuff at the sun. That’s easy, it’s up there, it’s big.’ But the problem is, we’re going around the sun and the Earth so fast — we’re going about 66,000, 67,000 miles an hour around the sun — and we actually need to send a spacecraft off the Earth and then slow it down so it can get closer to the sun. And so, just like you said, Venus is going to act as a break for us. “Venus has been neglected from us for a while. We had a spacecraft there called Magellan, back in the early ’90s, that mapped out the planet for the first time, and [what’s] so weird to think of is that here we have Venus up there, one of our closest planet that can get to the earth, and we didn’t even know what the surface of Venus looked like until 1990. “There were no Venus globes before then. When I was growing up as a kid, we had the Earth globe and maybe a little Mars, but that’s about it, and the moon. “It’s a mysterious planet, because it’s covered in clouds, so we can’t see through the clouds from ground-based telescopes. You have to really be close by to check it out. Now, it’s often called our sister planet, and I jokingly add in that it’s our twisted sister planet, because it is not really a pleasant place. This is probably the least hospitable place for us to go visit. “[It’s] 850 to 900 degrees on the planet, and there’s three ways to die on Venus real quick: One is you’re going to melt. Two, you’re going to be crushed by the atmosphere that’s pushing down on you — 92 times the atmosphere of Earth right there — and then three, if it starts raining, it doesn’t rain water. It rains sulfuric acid. “The atmosphere of Venus is so incredibly thick and dense, and it’s mostly made of CO2, so it acts like this greenhouse gas greenhouse gone wild. “We’re just kind of scratching the surface here on our understanding of it, but it’s seems that there’s a lot of evidence pointing to Venus having a very different past, that the atmosphere wasn’t as thick back then, that there could have even been liquid water on the surface. “When we look at the surface of Venus, there’s all these, this evidence of volcanism, where there’s volcanoes and lava pools and things like that that have all become dormant, and so something has changed on that surface of Venus, and we’re not sure if that is what caused this greenhouse effect, or if it’s been for a lot longer than that. But right now, it’s looking like Venus was a more hospitable place in the past. “I guess I like a nice planet where I can stand and live for a little bit. Venus, it’s not that we haven’t tried — that’s for sure. We’ve sent spacecraft after spacecraft to Venus. The Soviet Union sent a lot of these spacecrafts and landers, and they just kept failing and failing and landing and crashing, and the Americans would send things and they would crash. “Oh, I love seeing Venus in the nighttime sky. It is the brightest star-like object, brightest planet up there, and right now, it’s in the evening sky for the next month or so. You’re going to see it every night after the sun goes down, and it’s like this suspiciously bright light, it’s almost like a UFO coming at you.